Slay: Summon a copy of Morag Tong Aspirant. 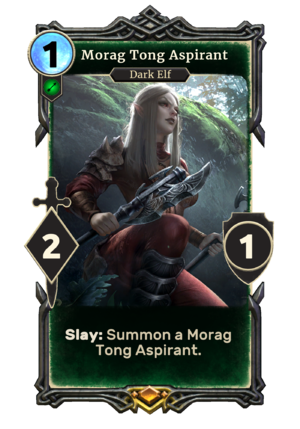 Morag Tong Aspirant is a legendary Agility creature card. It is part of the Houses of Morrowind expansion. "I want to be an assassin, like Naryu." "I will have my vengeance." The card is based on Veya Releth, who appeared in ESO as a Morag Tong apprentice and later an agent of Nocturnal. It was also voiced by Veya's actress, Helen Sadler. The card's summon audio alludes to Naryu Virian, who first appeared in ESO. This page was last modified on 2 March 2019, at 00:16.